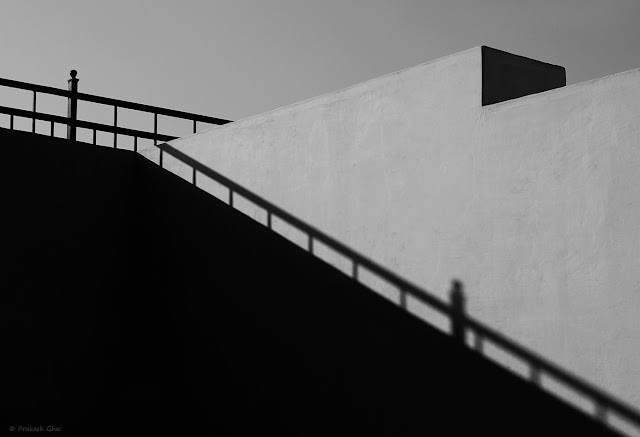 What we have here is a Black and White Minimalist Photograph of the Shadow of a Metal Railing at Jantar Mantar Jaipur, India, shot via Canon 6D Mark II Camera. This is a special photograph for me as I love long shadows and this one I took by getting downstairs the main Sun Dial at Jantar Mantar. I wanted to show the Shadow of the Bar with a Spherical shape on the top left, falling on the right side of the Wall. To add more interest into the photo, I also included the Black area on the top right i.e the Zig Zag kind of shape. Black and White was a Choice while shooting and I had my camera in the Monochrome mode. Would love to hear your Feedback on the choice of my Subject, the Elements and the Composition.